If you know anything about us here at Disney Food Blog, then you know we are PASSIONATE about our Disney cupcakes! 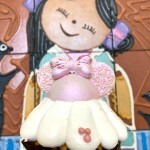 …That’s an understatement, actually…since we’ve even created our very own 2011 and 2012 Disney Cupcake Crawls! 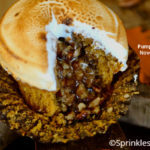 While some of these cupcakes are seasonal — and there are a few not listed that you can be surprised by (like the King Cupcake!) 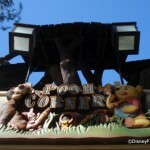 — this is a great compilation to get an idea of what’s waiting for you in Disney World! 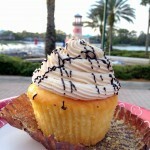 Now…are you ready to tackle the 2012 Disney Cupcake Crawl Challenge…?? Many thanks to Emma for allowing us to share her awesome work! Be sure to check out her blog! Hi AJ! 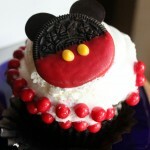 I hope you will also check out my Disney World Cupcake “Encyclopedia”! I’ve tracked the various cupcakes available and hope one day to try them all! Is this art that you can purchase? I love food posters for my kitcnen and I am a cupcake/Disney afficionado so I would love to have this! I’m so ashamed. 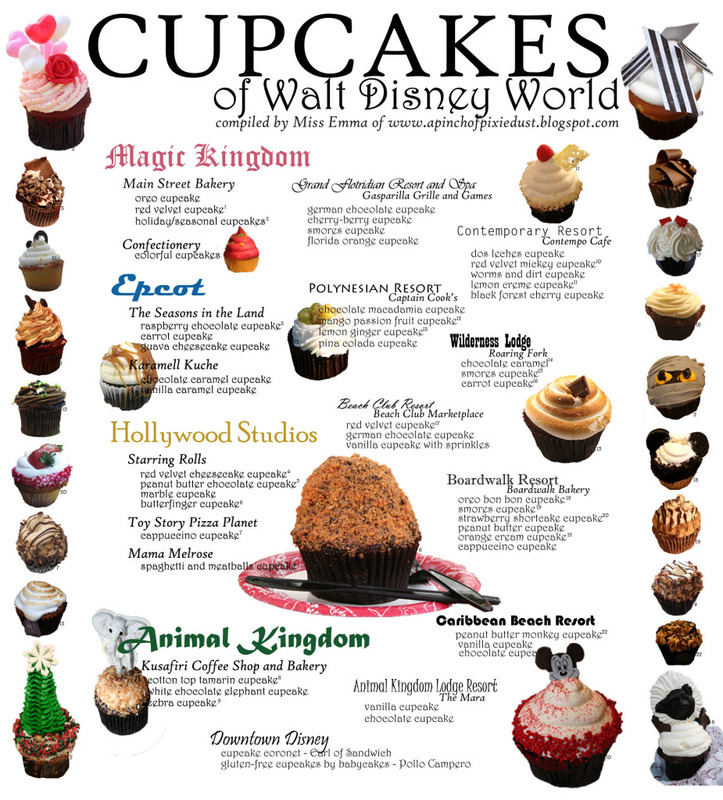 I thought I knew all the varieties of Disney cupcakes, but there are so many I have missed! Compiling that looks like time well spent to me! Are you trying to kill me?? Oh my goodness!!!!!!! We’re going to need to try some of these soon…each one looks more amazing than the one before!!!!! Thanks for sharing my “cupcake index” AJ, I’m so glad you liked it! lol, you’re right — shortly after I finished it, I noticed your post about the king cupcake. Must go check that out soon! I just printed it and we will be taking it with us to Disney World as a guide. Thanks! I LOVE THIS! I printed it out and put it in the “Magic” notebook (as my children call it) that I am compiling for our upcoming trip in September/October. Thank you again for all that you do for us WDW foodies. Canadians — I think it was in the round-up. 🙂 Pam Brandon featured it on the Disney Parks Blog; it’s on the kids’ menu at Mama Melrose!Try it and lemme know how it is! This is amazing!!! I’ve got an 8-day trip planned for September. I feel a sugar-high coming on already! That would be an awesome poster for my office 🙂 My sister had the Red Velvet and the Lemon Creme from the Contempo Cafe this week… she said the Red Velvet beat out the Lemon but they were both good. I want to eat them all… so many cupcakes… not enough time at Disney! This may be the greatest thing I’ve ever seen, lol. Thanks! The world would be a much better place if one of these were in every household…. Awesome work, thanks for sharing Emma & AJ! Just got back from the World, and had a Pineapple Coconut cupcake at the Land. To die for!! !